Most checks that you can configure in QSystem Monitor are IBM i-specific, but there is one important exception: the ping check. A ping can check any device that is available over the network and that can respond to a ping. That device can be another IBM i server, but it can also be a Windows server, a Linux server, a network router, or, if you are a bank, an ATM. They all speak the universal language of the ping. And, QSystem Monitor can use it to determine if the device is up and running, as well the connection latency. Start the Monitor module on your PC and connect to the host system. Ensure that the Data Selection bar is displayed. If it isn't, turn it on from the Home tab of the menu ribbon. This works as long as the names can be name-resolved on your IBM i, that is, DNS must be configured. Tip: Right-click the TCP/IP Address field and select Multiple from the menu. This allows you to enter several addresses and names in a row. This is great for bulk-creating ping checks. Collection Job Priority: Leave blank (this is only used in exceptional circumstances). All Systems/System Name: If you only want to ping from one or more selected systems, clear the check mark by “All Systems” and select only those systems from which the ping check is to be performed. 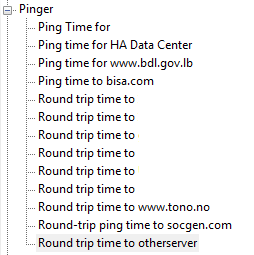 Collection Frequency: You can set how often the ping check is done. Each integer represents a 30-second increment. Therefore, a setting of “1” means every 30 seconds. “2” means every 2x30 = 60 seconds, “3” is 90 seconds, and so on. Use this if you don’t need to the ping to be updated often. 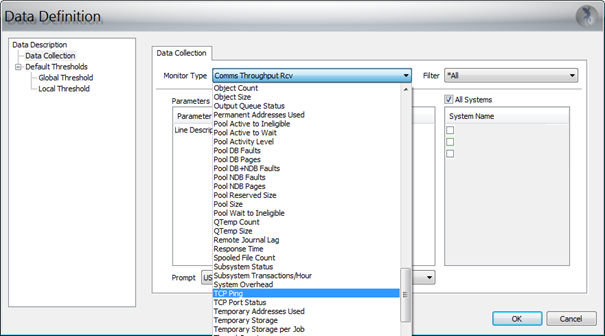 Placing related elements inside a group is a best practice for QSystem Monitor. A group is shown as a subwindow. 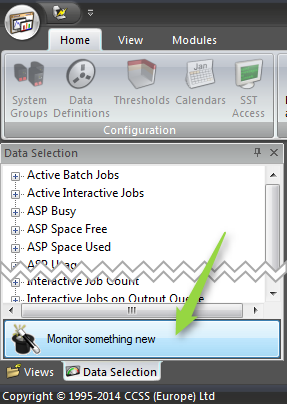 When you first install QSystem Monitor, any system view already contains two groups: one for bars such as CPU, and one for the text definitions. You can create an additional group to hold your ping elements. Right-click anywhere in the document window. From the right-click menu, select Group, then select Create New Group. Create in System only: selected. In the tree display at the bottom, click the User Text icon to highlight it. Click OK. The group is created. Add your ping checks to it by dragging them from the Data Selection bar to the group.